Of course, there are sleep disorders for which medical interventions are decidedly the right course of action, but for many people less invasive treatments are absolutely worth investigating. After all, that twilight state between waking and sleeping is virtually identical to a hypnotic state making it a perfect time to use positive self hypnosis. This Sleep CD provides you with a gentle and wonderfully relaxing guided imagery of walking on a beach with suggestions for sleeping deeply and restfully. 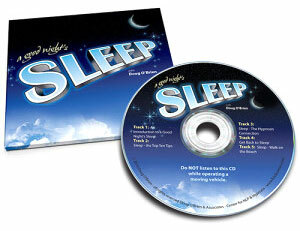 This CD also provides you with 10 tips for a sound night’s sleep, tips for getting back to sleep should you wake up, and a thorough explanation of how Hypnosis is a natural answer for most sleep issues. You also get a couple of links to download additional relaxing music for FREE… music composed exclusively for this sleep project. To get in touch with me simply use my online contact form. Find out what real clients and other professionals say about my hypnosis and therapy work on my testimonials page.